Yarn Type Another great value addition to the Hayfield family. Hayfield Baby Chunky comes in a range of bright youthful colours ideal for babies, toddlers and children. This chunky yarn is a fantastic 70% acrylic to 30% nylon blend. Hayfield Baby Chunky is a quick knit, easy care yarn that is perfect for creating textured cardies and easy knits sweaters, ideal for busy mums! 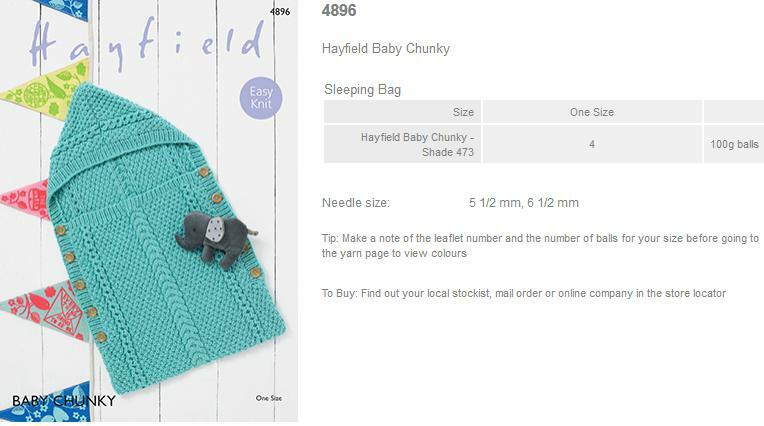 Leaflet with a design for a Sleeping Bag using Hayfield Baby Chunky. 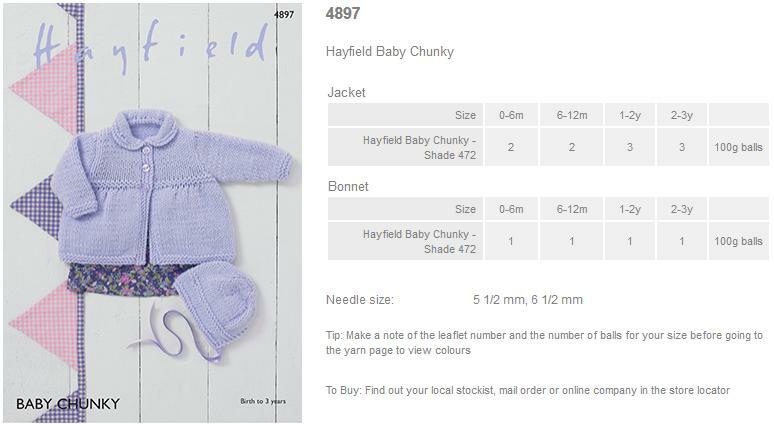 Leaflet with designs for a Jacket and Bonnet using Hayfield Baby Chunky. 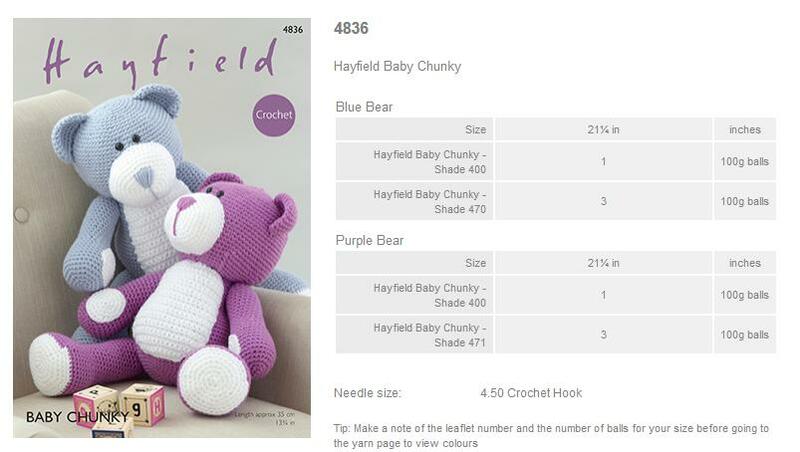 Leaflet with designs for Bears using Hayfield Baby Chunky. Leaflet with designs for V Neck and Round Neck Sweaters using Hayfield Baby Chunky. 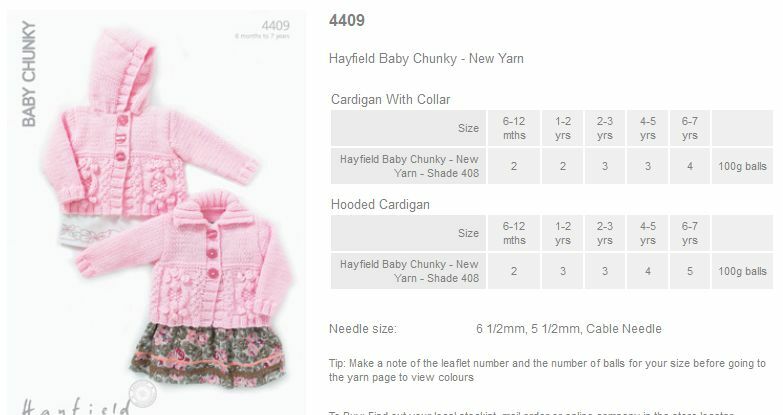 Leaflet with designs for a Cardigan with Collar and a Hooded Cardigan using Hayfield Baby Chunky. 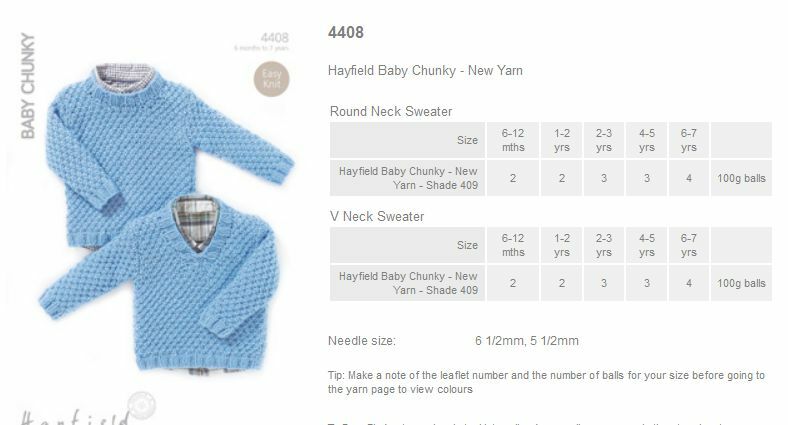 Leaflet with designs for V Neck and Round Neck Cardigans using Hayfield Baby Chunky. 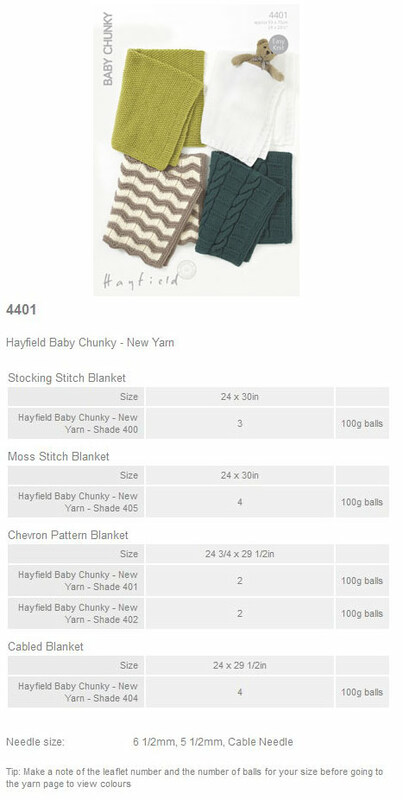 Leaflet with designs for a Stocking Stitch Blanket, a Moss Stitch Blanket, a Chevron Pattern Blanket, and a Cabled Blanket using Hayfield Baby Chunky. Leaflet with designs for Round and Wrap Neck Sweaters using Hayfield Baby Chunky. 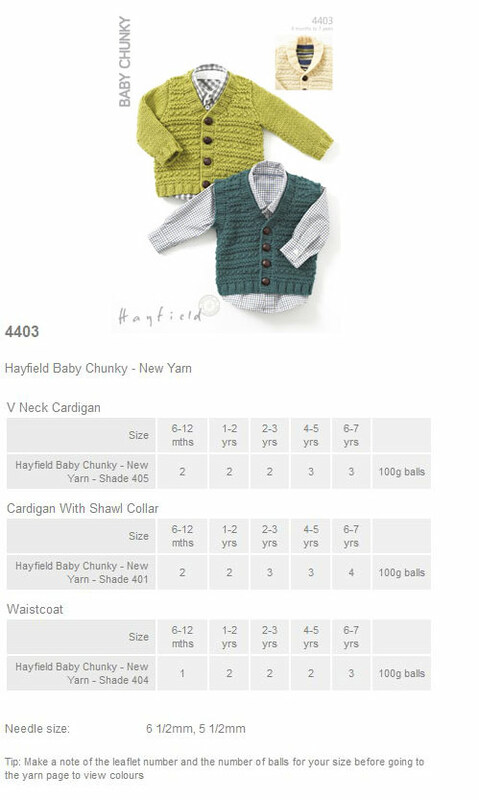 Leaflet with designs for a V Neck Cardigan, a Cardigan with Shawl Collar, and a Waistcoat using Hayfield Baby Chunky. 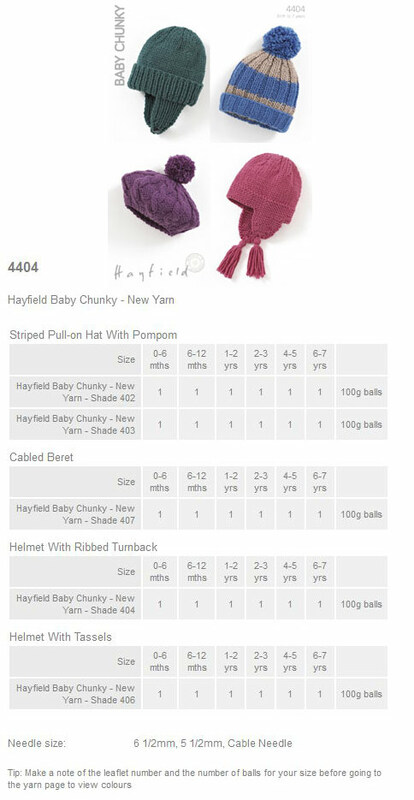 Leaflet with designs for a Striped Pull-on Hat with Pompom, Cabled Beret, a Helmet with Ribbed Turnback, and a Helmet with Tassels using Hayfield Baby Chunky. 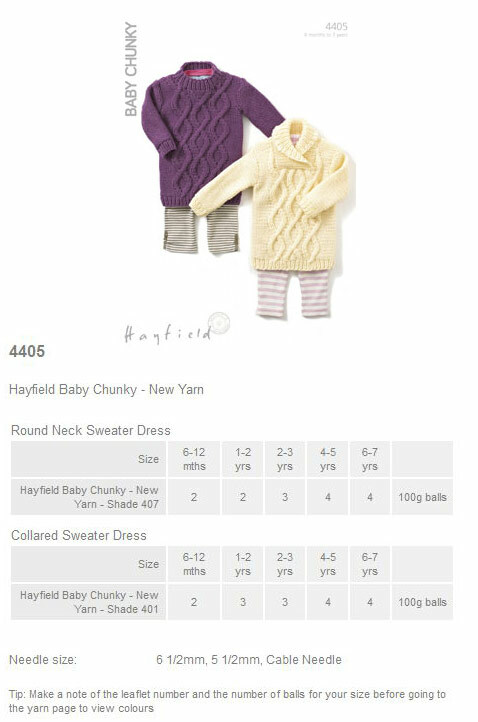 Leaflet with designs for a Round Neck Sweater Dress and a Collared Sweater Dress using Hayfield Baby Chunky. 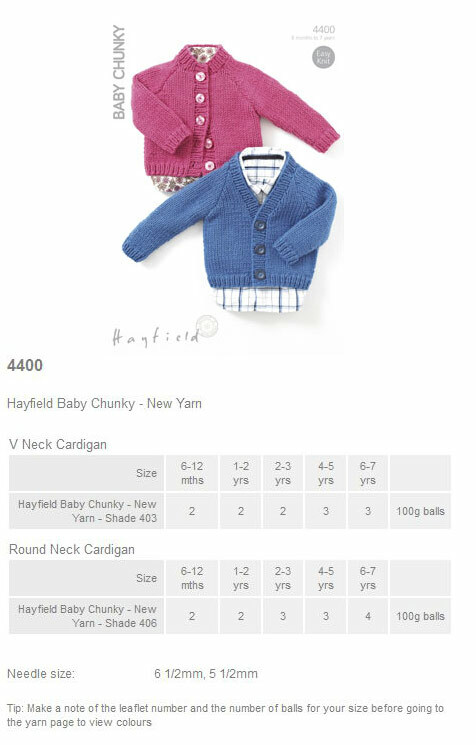 Leaflet with designs for a V Neck Cardigan and a Shawl Collared Cardigan using Hayfield Baby Chunky. 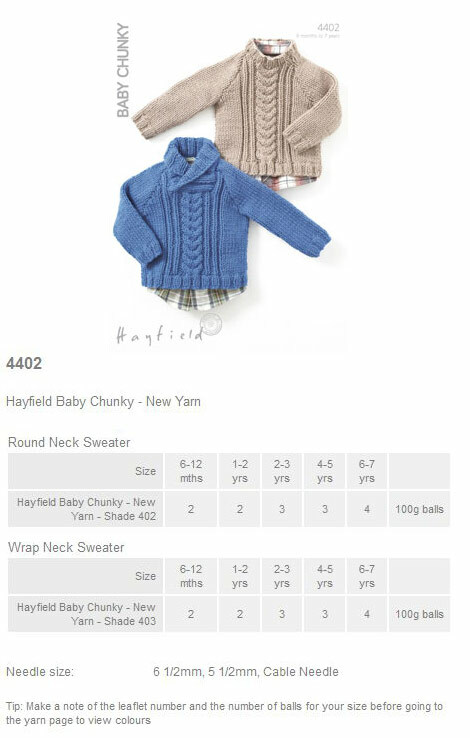 Leaflet with designs for a Round Neck Cardigan, a Collared Cardigan, and a Hat using Hayfield Baby Chunky.